Our environmental and natural resources practice offers broad Ohio, regional, and national experience to large corporations, small businesses, real estate development interests, and local governments. 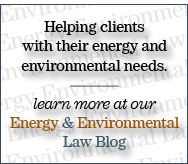 We provide a full range of legal services in the environmental area, including representation in regulatory affairs, permitting, compliance with federal and state law, commercial and corporate transactions, legislative initiatives, and litigation. Our attorneys have long-term working relationships with federal and Ohio regulatory and enforcement officials and have participated in the development of many aspects of Ohio's environmental regulatory programs. We draw upon the valuable insights we have from counseling and representing our clients as they address environmental issues and develop innovative solutions to environmental problems. A Better Approach To Environmental Prosecution?